​The Missouri Ice Hockey Officials Association (MIHOA) supplies all on ice officials for all USA Hockey sanctioned events and games held under the jurisdiction of Missouri Hockey affiliate. Each league has a process and rule that must be followed when scheduling officials for games. Please see the appropriate league page for further information. 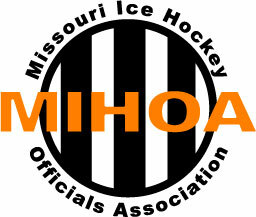 ​All teams in all leagues must register directly through the Missouri Hockey registrar before MIHOA will assign officials to games. If your team is not registered with Missouri Hockey, please contact the Missouri Hockey Registrar for the registration process. The leagues submit all regular season game schedules in addition to all league playoff game schedules for the securing of on ice officials. Any team that wishes to play exhibition games shall use the same procedure as outlined above to gain access to the MIHOA online scheduling system to secure officials.